One of the new features in VB 10.0 is collection initializers. Collection initializers allow you to initialize an array or list in a single line of code. 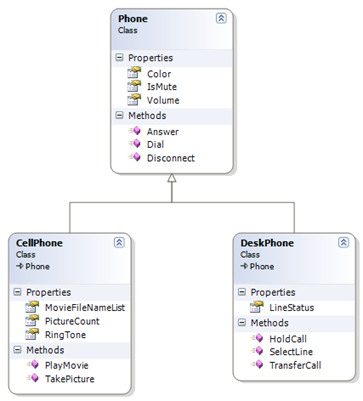 This example uses the customer class defined here and builds a list of customers using collection initializers. Notice how these two code snippets are very similar. VB even has the same curly braces! The key differences are that VB requires the From keyword when initializing the list, the With keyword when initializing each customer in the list, and the "." in front of the property names. Compare this VB example to the one shown for VB 9 (VS 2008) here. Use this technique whenever you need to initialize a list or array of objects. Before going through the details of how to use object binding, it is important to understand exactly what it is—and what it is not. Object binding is binding your business object properties to user interface elements. Object binding is not database binding in the strict sense of the term. It does not directly collect or bind any data from your database. 1. The business object calls the data access component to get the data from the database and sets the business object properties using that data. 2. The user interface component accesses the business object properties to fill the values of the controls on the form. 3. After the user makes any changes, the user interface component assigns the current values in the controls back to the business object properties. 4. The business object component updates the DataTable using the property values and passes it back to the data access component, which updates the database with the changed data. Using object binding allows you to skip steps 2 and 3. Object binding automatically populates the controls on the user interface from the business object properties. As the users change the contents of the controls, object binding updates the associated business object properties, keeping them in synchronization. That still leaves steps 1 and 4 for you. This link provides information on building a data access component to handle steps 1 and 4. In summary, object binding is the process of binding control properties directly to properties of your business objects. For example, you could bind the Text property of a TextBox control to the ProductName property of a Product business object. When the form is displayed, the runtime automatically displays the value of the ProductName property in the TextBox. And if the user changes the text in the TextBox control, the runtime modifies the ProductName property accordingly. This saves you from writing the code required to transfer data back and forth between the controls on the user interface and the business object properties. Visual Studio provides design-time tools for working with your business objects as data sources for your user interface, making it easy to bind each control to its associated business object property. The only requirement for your business objects to work with these tools is that the business object class needs at least one public property. No specific constructors, interfaces, or attributes are needed. When binding to a database, Visual Studio generates a significant amount of code and then binds the user interface to that generated code. Object binding binds to your code. That gives you much more control and greatly simplifies the maintenance of your application. Although it is much easier to think about object binding as a direct binding of a control’s property to a specific business object’s property, object binding frequently uses a BindingSource component as an intermediary. A BindingSource is a component on a form that binds the controls on the form to the business object. Each control is bound to the BindingSource component, which in turn is bound to the business object. This makes it much easier to change the binding for all controls by changing the BindingSource without having to separately rebind each control. You set the BindingSource to an individual business object instance in your code. The runtime then binds all the properties associated with that instance to the controls, thereby displaying the business object property values in the controls. And as the user changes the content of any controls, the business object property values are changed accordingly. A form can contain multiple BindingSource components. For example, a ProductWin form can contain product data and display a drop-down list of product types. You can define a BindingSource component for the product data and a second BindingSource component for the product type data. must implement all properties and methods defined by that interface. for both the connect and make tone methods. is left to the class that implements the interface. A base class contains both the list of properties and methods and their implementation. The class that inherits from the base class does not need to provide any implementation. In this example, the interface is comprised of three methods: ProcessDelete, ProcessNew, and ProcessSave. Each of these methods must be implemented in any class that implements this interface. for all three of the interface methods. class and the rest of the application, and the compiler enforces this contract. interface must be implemented before the class successfully compiles. In object-oriented (OO) terms, inheritance defines an “is a” relationship between two or more classes. A beagle is a dog, and a poodle is a dog, so both beagle and poodle inherit from dog. Both beagle and poodle have dog attributes and exhibit dog behaviors. A dog class in this example is called the parent class or base class, and the classes that inherit from it (beagle and poodle) are called child classes or derived classes. phone attributes and behaviors, such as volume, dial, answer, and disconnect. derived) classes. You could draw this relationship as shown below. for answer is defined in the base phone class. the functionality of the .NET Framework classes in your application. You can see inheritance in action as soon as you create your first form. Framework’s Windows.Forms.Form class. In C#, a colon separates the class name from the base class, which again is the Form class. This Form class provides all the common code required to make your form work like a Windows form. NOTE: In VB, the designer file is, by default, hidden from view in Solution Explorer. To see the designer files for a VB project, select the project in Solution Explorer and then click on the Show All Files button in the Solution Explorer toolbar. Repeat the process to hide the files. base class that contains this property instead of adding it to every class. Every business object class can then inherit from this base class and therefore have this property. that common code, you have to change it in only one place. easy to become overwhelmed by the complexity. a time, temporarily ignoring the complexities of the rest of the system. and data details are irrelevant. fits into an overall system. a data access object, and so on. language, using an object-oriented approach to thinking about your application makes it easier to map these thoughts into object-oriented code. Excerpt from "Doing Objects in Visual Basic 2005".